After a few days at White Wash Dunes, we headed over to Caineville for a couple days. It takes a little over an hour to make the trip after you reach the highway. The riding here is much different and it's really hard for us to say what we like most, but we wouldn't want to be without either one! The soil at Caineville consists mainly of clay. It can get close to the consistency of sand in some areas, but the clay like soil can get downright hard too. Even though there is this wide range, most of the riding is somewhere in the middle and allows you to hook up really well, but still give a little. 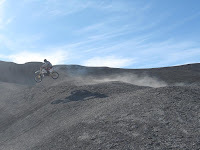 There is anything from insane hill climbs to huge jumps, narrow ridge trails, to narrow canyon rides. It's a shame so much was closed down, it really limits the longer desert type rides that you might find in the Moab / Green River area. The scenery is breathtaking if your a dirt biker, but it doesn't change much and it takes a certain type to see the beauty here. When we left White Wash Dunes, there were probably close to 40 or 50 people, but at Caineville only a handful on part of the day Saturday, then we had the place to ourselves. There is just something special to us about this place since we have so many memories here, it's really where our boys learned to ride, and we had a blast again this time! Here's a little taste of some of the riding we did. I'll be posting up some video footage later. Enjoy! So awesome dude! I am thinking of joining IMBA to keep the trails open in Southern Utah and Fruita, CO area. I don't ride down there that much but it would nice if it was open so it wouldn't be crowded here in Sanpete! But I do need to ride in Southern Utah too though. If my good ol' biking buddies go to Fruita this weekend, I will have a chance.